The Drone Club, a group dedicated to helping students build, fly and program drones met on Feb. 7 to develop plans for drone racing. 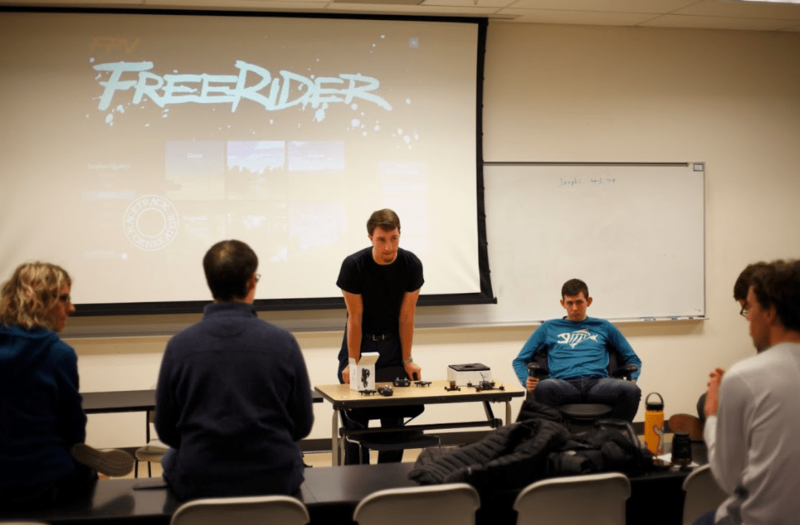 Jason Seper, a senior majoring in mechanical engineering with a minor in aerospace engineering, discussed building and programming a racing drone, and the possibility of creating a chapter for MultiGP, an international community of drone racers. Until the drone is built, Seper and the other members of the Drone Club are organizing practice times to learn how to safely and effectively pilot a drone. “For weekends,” Seper said, “we just want to practice because we’ve got to gain control of the drones and make sure everybody’s got a good, solid foundation in flying and safety.” Developing one’s skill, said Seper, can help with flying for recreational and racing purposes and for filmmaking and aerial photography. One difficulty lies in finding an open space that is not occupied, where the drones will not be a threat to people, property or aircraft. Seper hopes that these weekend practices will be able to take place outdoors on the north end of the UCCS campus, near the Mountain Lion Fieldhouse and the newly constructed baseball diamond. Permission is still needed from school officials before sanctioned flights can take place. Seper said he wants to build a racing course with official equipment for prospective pilots to practice on so that everyone has a chance to challenge themselves in a safe and educational environment. Students are welcome to bring their own drones and equipment, Seper said, as long as they understand that they are liable for any damage to their equipment or to property. Drones vary greatly in size and capability, ranging from simple mini quads for indoor flight to the more professional grade racers that are built to handle the outdoors. One common drone piloting technique is known as first-person view ( FPV). When flying an FPV drone, pilots are able to see what the drone sees through a specially mounted camera and with help from either an LED screen or a virtual reality headset. This, according to MultiGP, gives pilots “an immersive experience,” and the feeling of being inside an actual cockpit. For the inexperienced pilot, the Drone Club offers a virtual simulator that can be used at any of the group’s weekly meetings to give novice pilots an extra avenue for practice. Seper mentioned that, while piloting a sophisticated drone may look easy, it takes more practice than most people imagine. At the time of print, the Drone Club had 17 members on its Mountain Lion Connect (MLC) profile, and Seper said he and the other club leaders hope to gain more in the coming months. Once the weather improves, that will be the time to get outside and practice with larger drones. The group plans to continue their weekly meetings in Centennial Hall, where students can have a chance to fly the smaller indoor drones and practice with the simulator. Anyone who is interested in attending a meeting or asking questions can contact Seper at jseper@uccs.edu, or visit the club’s profile on MLC.